On the 25th March 2019 a new joint palaeontological fieldwork expedition was announced. This fieldwork will see palaeontologists from the Natural History Museum London, The University of Manchester, The Children’s Museum of Indianapolis and the Naturalis Biodiversity Centre in the Netherlands work together in the Badlands of Wyoming USA to discover new Jurassic dinosaur remains in addition to other animal remains from 150 million years go. This article will share my thoughts on this fieldwork project, which will be starting this coming June and why Wyoming remains my number one dinosaur field site locality to visit. The past few weeks has seen some pretty amazing palaeontological discoveries and research published. Let’s have a quick overview of what took place shall we? On the 21st of March palaeontologists at the University of Alberta published research surrounding the biggest Tyrannosaurus rex found so far in Canada. Known as Scotty this Tyrannosaur was 13 metres long (42 feet in length) and would have probably weighed some 9.8 tonnes! It lived 66 million years ago and is the largest dinosaur skeleton to be discovered in Canada. The research about Scotty was published in the Journal of Anatomical Record. Cast of Scotty the Tyrannosaurus rex. Image credit: Amanda Kelley, 2019 via Live Science. Then on the 24th of March the mass media picked up the research in the Journal of Science about a major fossil discovery haul in China’s Hubei Province. These fossils were from the Cambrian period over 500 million years old and feature many soft body tissues which have been fossilized, known as the Qingjiang biota. Major palaeontological announcements would not stop there however as on the 25th of March the ‘Jurassic Mission’ fieldwork expedition project was announced to take place in the Badlands of Wyoming. A £20 million joint project which would see over 100 palaeontologists and scientists working together to excavate in the Morrison Formation, a world famous Jurassic dinosaur fossil locality this coming June. This fossil arthropod is just one of many that has been found at the Qingjiang fossil site. Image credit: Fu et al, 2019 via ZMEScience. Finally on the 29th of March research was also published in the Journal of PNAS about the fallout from the Chicxulub meteor impact 66 million years ago. Where fossil excavations in North Dakota have revealed geological deposits of fossilized assemblages of fish, tree branches, dinosaurs, marine organisms and much more! Furthering our understanding of what we knew of the devastating effects the Chicxulub meteor impact had on the earth. All of these palaeontological discoveries have been very important but for the purpose of this article I want to look at the really fantastic fieldwork expedition that will be taking place in Wyoming this June. So the dig that is going to be taking place this June in Wyoming has been dubbed ‘Mission Jurassic’. The aim of the expedition is to excavate and uncover fossils in the ‘Jurassic Mile’ in the north of Wyoming. The project has significant funding and the area in question has not been extensively studied before so it is very much hoped that the fieldwork could bring about some truly exciting Jurassic discoveries. The Morrison Formation where the fieldwork will be taking place is one of the most fertile fossil localities in the world providing palaeontologists with a wealth of dinosaur discoveries such as Allosaurus, Stegosaurus, Ornitholestes, Diplodocus, Brachiosaurus, Camarasaurus, Apatosaurus and many more. One square mile of Wyoming ranch land has been leased for the field project. Image credit: The Children’s Museum of Indianapolis, 2019 via BBC News. Nearly 600 specimens have been discovered and collected from the site over the past couple of years already despite the fact that only a small fraction of the site has been explored (The University of Manchester, 2019). The expedition will be excavating through a variety of geological past environments at the field site including a “river and flood plain setting and another that records a marine history” (Amos, 2019). ‘Mission Jurassic’ should hopefully uncover not only more dinosaur fossils but fossils of other life from the Jurassic as well including crocodiles, lizards, turtles, plants and much more. The result of which will not only lead to more fossils and bones being transported to museums for clean up and display, it will also lead to more research and better understanding of what life was like during the Jurassic period some 163 million years ago. The Badlands of Wyoming has always been a major dinosaur fossil locality I have wanted to visit ever since I was a child. In my palaeontology & me article I shared about what fossil field sites I would like to do fieldwork at one day. The Morrison Formation in particular is such a gold mine of fossil discoveries that I just have to spend some time there. Having seen documentaries of fieldwork taking place in the formation in the past there is so much history to discover and uncover that just to be able to set foot on the formation would fill me with utter joy, let alone finding anything fossilized! Just to able to take a moment to take in the environment and think about how it might have looked millions of years ago, it would be such an incredible experience. 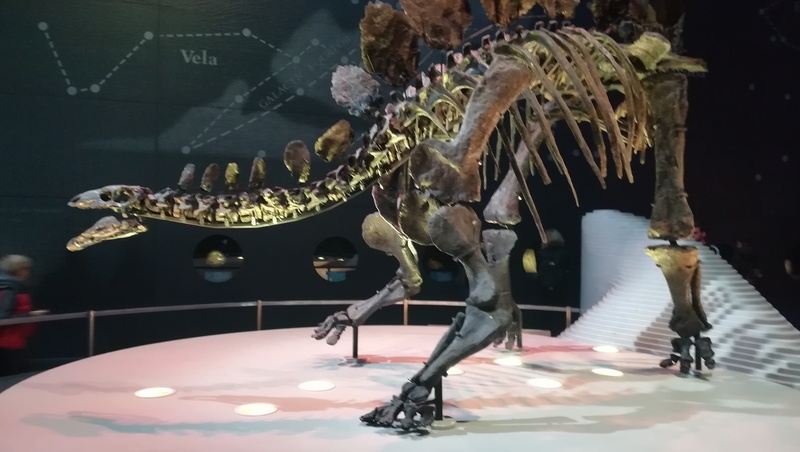 Sophie the Stegosaurus is one dinosaur example to come out of Wyoming, here displayed in the Earth Hall of The Natural History Museum in London. Image credit: James Ronan, 2018. I hope you have all enjoyed this article giving my thoughts on the really interesting fieldwork that will be taking place in June in the Morrison Formation. Wyoming still has so many dinosaur fossil discoveries to offer so it is really fantastic to see this project be funded and the amount of team work taking place in ensuring it can go ahead. Truly inspiring! I am planning on writing my next article for Jurassic Finds in late April so you can look forward to my next article then. In the mean time you can catch up with all my previous articles on Jurassic Finds here. Next Jurassic Finds Reaches 5,000 Views!